The stuffed animal is made of plush fabric and pp cotton and other textile materials as the main fabric, and the inside is filled with various fillers. The stuffed animal has the characteristics of vivid and lovely shape, soft touch, not afraid of extrusion, convenient cleaning, strong decoration, high safety, and wide application. 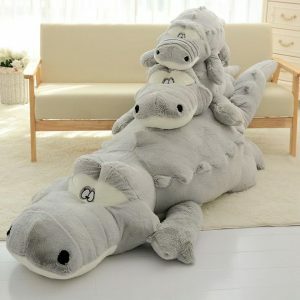 Therefore, stuffed animals are a good choice for children’s toys, decorative houses, and gifts as gifts. stuffed animals are big and small. This article mainly focuses on large stuffed animals. Generally, we call 80cm (31.5 inches) and above a large stuffed animal. There are many toys, animals, fruits, and things in life. As long as you want to do it, you can customize it. First of all, we must understand the internal components of the stuffed animals. Some of them are filled with straw and bean hulls. These can’t be cleaned. It is easy to wash. It can only be wiped with a wet towel and a soft brush. Add the detergent to the water basin, and flush in some water, stir the water in the basin with a soft brush, stir up the rich foam, and then brush the surface of the stuffed animal with a soft brush. Be clean, be sure not to get too much moisture on the brush. After brushing the surface of the stuffed animal, wrap the stuffed animal in a bath towel and put it in a basin filled with water to clean the dust and washing liquid in the stuffed toy. Then put the stuffed animal in a water basin filled with softener for a few minutes, then press it several times in a basin filled with water until the water in the basin becomes clear from the turbidity. The cleaned stuffed animals are still wrapped in bath towels and dehydrated in a washing machine. The dehydrated stuffed animals are shaped and combed and placed in a ventilated place to dry so that your stuffed animals will look like new ones. First of all, we have to go to the supermarket first and spend 2 yuan to buy a large packet of salt, that is, coarse salt. After we go home, we put the coarse salt and the dirty stuffed animals together in a plastic bag, and then fasten the bag. Shake hard for dozens of times. This time, you must find that the stuffed animal has become clean. The removed coarse salt turned grayish black due to the adsorption of dirt. The principle of this coup is to use the salt, sodium chloride, to absorb the dirt. Residents can make a difference. Small things like plush collars and plush cushions in the car can also be “cleaned” in this way. At the same time, the salt plays a role in sterilization. For that cake, you can use a hairdryer and comb with a comb while blowing. This will restore the original look. If you want to buy a large stuffed animal, you can contact us and we offer customized service. You don’t have to worry about the size of the stuffed animal, which increases the space. Usually, we will pack it in a vacuum. 1. Put the toy into a transparent gift bag, and squeeze the toy with both hands to make it smaller. 2. Then quickly pull out a hand to grasp the transparent bag mouth, leaving a little gap, the other hand left in the bag to continue to squeeze the toy, the air out of the bag. 3. The transparent bag is attached to the toy at all angles as the best state, just like the transparent bag is attached to the toy, and the ribbon can be tightly tied with the ribbon.